Jan 2007. 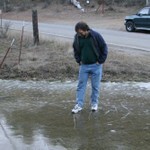 Peter standing on water. Peter watches while Tristan stands on water. Tristan walking, gingerly, on water. Jan 2007. What's left of a night's snowfall on Mt Diablo by 11am. Jan 2007. Rosemary and her cane on Mt Diablo. Rosemary can't quite stand upright yet. Rosemary couldn't resist picking up an interesting rock. Making up for the post-operative bans on bending for weeks after each of the surgeries. Feb 2007. Peter about to do a boring job. It's too wet to snowboard at Kirkwood so what else is there to do? Some of the feathered friends in our back yard. One of our family of furry birds eating bird seed. Watching them fly from the patio roof to the feeder is quite interesting. A close up of the furry bird. Spring mists in the mountains outside our back door. Mist on the mountains outside our front door. Closer view of the mountain and the mist. Tristan and Peter in the kitchen. Note Tristan's toes. A clearer picture of the situation. Take one bored kid, add a black marker pen and look what you get.